the pictures showed in Agoda are totally different from what we experienced. it's not the building we were arranged. we were assigned to another building down to the street. after checking it, we needed to walk to that building outdoor. not boiler provided. the reception staff was not friendly. i won't recommend it to any of my friends. The room and the breakfast was surprisingly good. Check-in staff also, but rest of staff doesn't bother to greet or take notice of you. If this is fine to you, I can recommend this hotel. There are rooms in two buildings. I have been in a room in the building with the restaurant. Facility was clean, room was small and parking was hard to find. Breakfast was great though. This hotel was excellent to stay at as we were attending a gig at Das Bett which is just down the road. 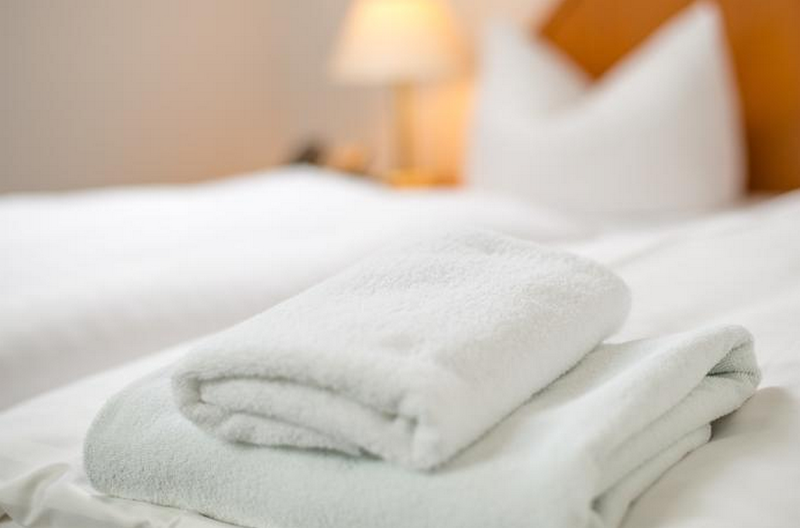 The hotel was great for the price and the staff were very helpful. The only slight downside was that it's not central to Frankfurt and costs a fair bit to transfer to/from by taxi. Rooms are in very good condition, and the breakfast is just fine. The room size is little bit small and I believe the hotel is good for young travelers. My favourite band, mesh, were playing at the Das Bett venue which is about 300 metres from the hotel. I booked the hotel because of its location. The reviews of the hotel were very average but I was pleasantly surprised. 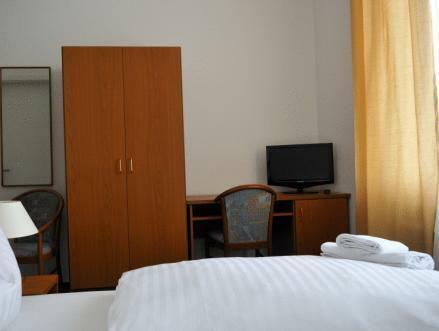 The rooms have recently been renovated and they are all very nice. Staff were great and I would definitely stay again. 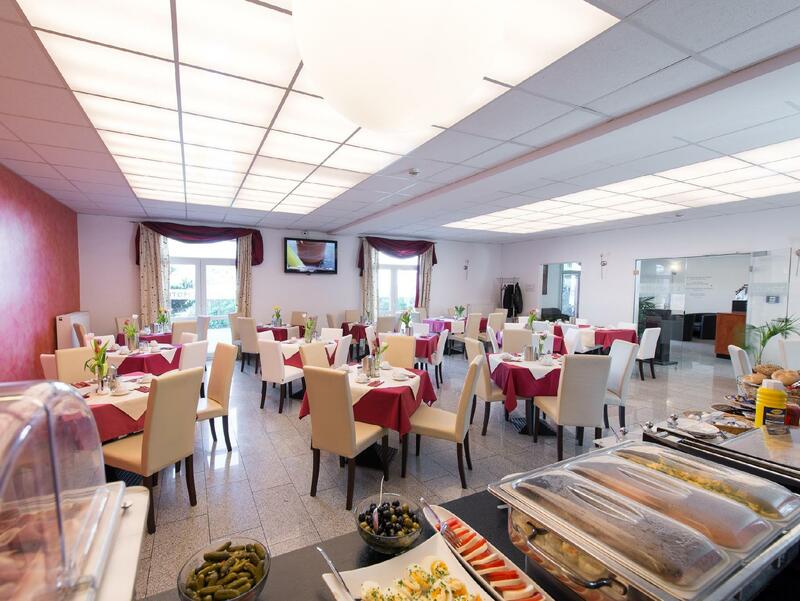 During the high season when just everything else around the center of the city is unavailable except with triple prices, this hotel maintains some competitive price level. You shouldn't expect much from them, though. Rooms are really tiny, and almost clean - though just barely so, as the hotel isn't much on quality of regular cleaning. 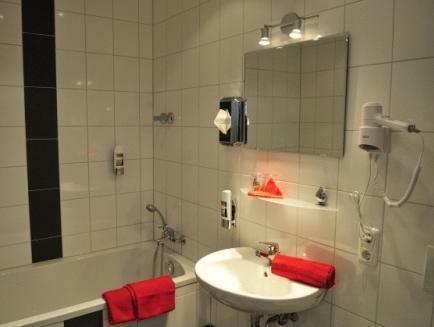 Bathroom is just barely adequate - lack of shower curtain makes everything wet, and lighting is particularly inconvenient for shaving (the latter is annoying as it should take just some planning and minimal effort/costs to replace the lamps with frosted glass options). Location is quite workable with - it's quiet, and within just a 4-5 minutes walk from the 11/21 line tram station at Mönchhofstrasse. While it's not very convenient for transit to the Messe area, it's rather close by tram to the Hauptbahnhof and Galluswarte S-Bahn stations - and thus reasonably fast transit to just anywhere, including the Messe area, is more or less assured. One aspect of their Schmidtstrasse location is that it's often unfamiliar to taxi drivers - so that some explanations are helpful (like "Schmidtstrasse in Gallus behind the Ferrari and Maserati shops") to prevent occasional mistakes by drivers. Breakfast - quite satisfactory, as it's rather standard for most German hotels. Wireless Internet - somewhat slow but stable, no complaints in this regard. Service and staff - reasonably satisfactory and helpful. There are some limitations like inability to arrange late checkout - but with German hotels some things just aren't available. It was free and easy for my one day visit to Frankfurt. J'ai réservé une chambre double et on m'a donné une chambre single, le service est malheureusement n'etait pas à mes attentes. 조금 트램역애서 거리가 있지만, 한국에서 지하철 타러 가는 것 보다 조금 더 걷는다고 생각하면 아주 멀게 느껴지지는 않습니다. 가격(저는 2박 134천원) 대비 그 정도면 나쁘지 않다고 생각되고, 일단 깨끗하고, 차로 이동하시는 분들께는 주차장이 넓어서 좋을 것 같고 다른 비슷한 가격 범위의 유럽 내 호텔보다 방도 넓었습니다. 욕실이 상대적으로 작다고 생각하실 분도 있을 수 있겠지만-샤워부스가 피자 조각처럼 생겼고, tube는 없으며, 세면대는 제가 본 것 중에 가장 작습니다- 자기 집이 아니고 여기 평생 살 것은 아니니 괜찮을 듯 합니다. 숙박하는 동안 가족여행 보다는 출장자들이 많았던 것으로 기억합니다. 결론적으로 저는 매우 만족스럽게 보냈던 호텔입니다. avevo prenotato una camera tripla, questa era una doppia con poltrona che si trasformava in letto , pero era posizionata davanti al bagno quindi a letto aperto per andare in bagno occorreva fare lo slalom. Spesso anche in orario normale di colazione per esempio ore 9 ,non provvedevano al refill del buffet che quindi appariva sguarnito e non completo delle cose che si erano viste il giorno prima. Difatto era un motel la mia camera dava direttamente sul parcheggio dell auto a pian terreno. Da ultimo all'arrivo un po di sconforto perche in una zona di officine meccaniche , quasi nascosto da capannoni. Las habitaciones son un horno, y a pesar de tener instalación de aire acondicionado, el aparato estaba programado para no poder encenderse ni modificarse. La habitación también estaba infestada de mosquitos. Fui con una amiga y nos despertamos a las 6 de la mañana porque otro huésped estaba hablando por teléfono gritando a su interlocutor, durante un buen rato. El personal no hizo nada para acallarlo. Como extra, el hotel está muy mal comunicado con el centro, sin conexiones con transporte público a cualquier zona mínimamente cercana al centro. Relación calidad-precio totalmente descompensado. Llegamos un domingo por la mañana. Había una bombilla reventada, el mando de la televisión no funcionaba, y no había tapón en la bañera. Todo esto se comunicó a recepción por la mañana. El recepcionista nos dijo que mandaba al técnico. Durante el día estuvimos fuera, y por la tarde todo seguía igual. En recepción, ya había otro trabajador, nos ofrecieron otra habitación: con acceso sin ascensor y con tres camas (somos cuatro). Nos quedamos en la misma habitación con sus inconvenientes, y cenamos dos pizzas, que fue lo único que nos pudieron ofrecer, ya que esa noche, domingo, no había servicio de restaurante. Todo ello ocurrió mientras sólo había un recepcionista, que había que buscarlo por el edificio, ya que no daba abasto con los problemas de los clientes. Además, por la noche hubo un grupo de personas riendo y gritando justo frente a nuestra ventana, en un lugar que se supone para descansar por las noches.